Magnus is a 29* year old human male and Sith Lord of The Dark Lords of the Sith. 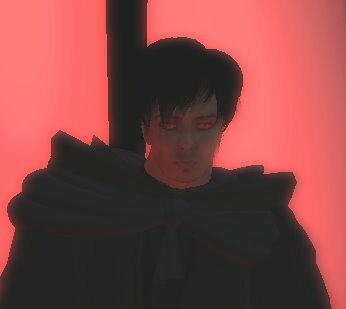 He was once a Jedi Knight and Ambassador on Telos IV before turning to the dark side. His existence began because of renegade Sith from Byss and despite the path he took, his destiny always led back to the Sith and he is now fully consumed by the darkness. On Byss, a group of renegade sith lords became aware of a young woman so strong in the force that she must become a Sith or would be a threat to all as a Jedi. These renegades also felt she was the one to use for experiments that had been discussed for many years…an experiment which could seal their rise to power in a new Sith Order. Many believed there should be a generation of Sith bred from dna of long dead lords, it was seen as a faster option compared to research into Darth Plageous’s methods and harnessing his power on a large level. After the woman was taken over to the dark side by one of these sith lords, they saw to it that a blood sample would be taken from her and the DNA from an honored Sith master would be used. The young woman, her name then being Jitt Baumer, had her memory erased of these events as they believed she would see her offspring as a threat to her and want revenge on those that used her. In the 'first generation' there would be 2 sith bred, a male and a female. The new sith had a high midi-chlorian count. They would have advanced aging genes activated and their intelligence programmed gradually. Within weeks, the 2 were intelligent 18 years old (physical age)and from that point on they would develop naturally. 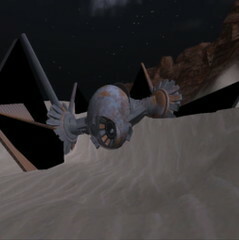 The renegades were pursued by sith assassins, seeking to kill all exiles. Knowing that they cold not succeed in their experiment and the danger they were in was becoming clear, the renegades has their creations memories programmed one last time - to erase information about their creators and the knowledge of each other as siblings. The male was placed on Rakata Prime once the new programming was implanted. The whereabouts and identity of the female is unknown. Neither of ‘gen 1’ were given sith names until they had proven themselves, this male was given a human name. Morten was a corruption of a Bespin native name, Hassanov was of Naboo language meaning 'to serve'. Beginning his training on Rakata Prime after being noticed by Darth Deveraii. The signs of a strong force user was there and Deveraii was concerned such a strong one should have been well known by the Dark Lords on Byss much sooner. Morten did not complete his training with Deveraii, he saught to harness his growing power alone. It is not known why Deveraii did not pursue Hassanov. Hassanov was studying the dark side closely..but not all to his teachings…discovering a sith holocron on a moon in the outer rim, he studied the ability of becoming invisible in the force…something he learnt to do very quickly and soon believed his power would be greater then that of Deveraii, but he knew he could not yet challenge one like him. Fate lent a hand when Rakata Prime was attacked from space. 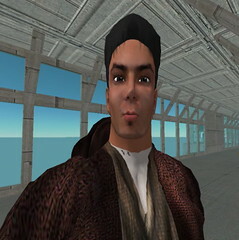 Hassanov hid his presence in the force and isolated himself in a disused military base under the sea. The underwater base had active computers and he found that the attack was focused on the city and the best the computer could do was find the word 'Mandalorian' in the transmission that was sent before the attack began. A Mandalorian was the target?, or were the ones attacking?….he could not know….but he did not care….this was the chance to escape on his own…stay invisible in the force and find a new challenge. The ‘mother’ of the engineered Sith became a strong sith herself, taking the name Lady Sage and proved to those on Byss how powerful she was destined to become. 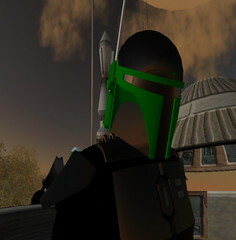 Morten found an operable ship and flew it to the planet known as Dxun and was recruited to the ranks of the Mandalorian Dala Clan where he would be known as Kovac Dala. Here he felt he belonged to a group where he could make a difference, his membership of the Dala Clan reflected his need for security. In time however, he became increasingly sidelined by the Mandalorian need for increased security for which he believed was too much and would spell the end of the Dxun clans in time. Kovac Dala was unfulfilled by the experience of being a soldier, so he left the armor and the name that went with it behind. Morten was never comfortable repressing his force powers, as he had been. However, he could not ignore the force visions of the Planet Endor that became more and more frequent, also a woman he had never known but felt familier became part of the visions. He also noticed his time on Dxun had focused him and the sense of honor in all his actions, so he took that with him as he drifted in space. Information from Bothans led Morten to the knowledge of a Jedi Order on Endor. He left the Mandalorians and his Sith beginnings behind and arrived on Endor to become a Jedi. Endor was just as he had seen it in his vision, but the female presense he felt in those visions continued to puzzle him. He became the Padawan to the Jedi Knight… Lady Sage… who had turned from the dark side but felt she could no longer use her old name. Morten felt a bond very quickly to his Master, which he believed was the normal attachment a Master should form with a student. The deeper feeling of connection was confusing, having known her a short time, however he believed the strength of the visions colored his perceptions, it could just be that he merely foresaw becoming a Jedi under the teachings of Lady Sage. The downfall of the Jedi Unity order led him to wander the galaxy, spending some time at Anoth to study and he visited places such as Ossus in a bid to continue his Jedi path. Losing contact with his Master left an empty feeling that he was sure was not right, it took much meditation on Ossus to put these feelings aside and maintain his control again. While deep in study on Anoth, he received a communication from Shadow Jedi Master Delcon, inviting him to his orders secret enclave. On meeting the honoured Master Diakonos Delcon, he joined the order and began training as a Jedi Sentinel with Master Atticus Jetaime. Seeing his former master Lady Sage turned again to the dark side was a surprise to him, but on another level it appeared right..something he could not explain. Soon after moving to Telos IV, the order changed. The Telos Jedi Order was formed, its members were the bulk of what was the Shadow Jedi Order. Master Jerico Yost took his Shadow Jedi Order away from Telos, back to the secrecy from where it came. On becoming a Jedi Knight, Master Delcon gave Morten the duties of being an investigator and to persue justice on the orders new home of Telos IV. he reward for his achievements was when he was made Telos IV Minister, Ambassador for the Jedi order. In his Ambassador role he helped to negotiate an alliance between four Jedi Orders. On drafting an agreement between the Jedi Orders, the Jedi High Council was formed. While continuing as Ambassador to the High Council, Morten realised he needed to move on and Jedi life on Telos was no longer as fulfilling as it once was. He left Telos behind for Yavin IV to begin again, where he began training with Master Evelyn Syaka. However the burning need to be more than he was began to trouble Jedi Hassanov…he did not feel like the Jedi he had been in the past. 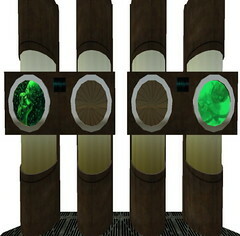 One day on Telos IV, Morten became aware of a call from Lady Sage in his mind needing his help. Drawn to her, he found out she had been hurt when her ship crashed on the planets surface. In seeking to offer any assistance he could to his former Jedi Master, Morten took a blood test to see if he was a suitable donor. The DNA from the blood was too close a match…Lady Sage was Mortens (genetic) mother. Much meditation was needed for Morten, his emotions almost overflowing with the knowledge of his former master being his mother. 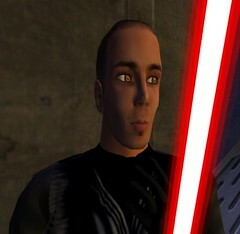 While continuing training, the growing discomfort that Morten felt began to express itself…as he began to see weakness within the Jedi Order, he believed that strength and control were what was required to call the jedi to order…and why should he wait…it should be him to lead the jedi, it was what he was born for. Resentment built up, but meditation kept the dark feelings supressed. Researching the sith to discover truths of his origin, Morten began to admire the order and strength a Sith Lord could command. After much discussion the Jedi believed that the death of Lady Sage was the only way to end this threat and to then retrieve Hassanov. Unsure if this was in keeping with the Jedi code..the jedi stalled…allies of the Jedi – The Silver Jedi…secretly sent 2 of their Jedi to kill Lady Sage and return Hassanov. They found Hassanov meditating with Lady Sage…seeing it as Sith training…they warned Hassanov off and ordered him to leave for Yavin. Lady Sage told Hassanov to do what they said…and he began to leave for his ship…..he felt the danger his mother was in and he returned…to see her weakened and the silver jedi changing his grip to plunge his saber into her heart. Morten ignites his saber and warned them off….responding to him with a warning of his own safety…Morten launches an attack on them… severing the arm of one…and using the force to push the other away. This rush of anger and power tasted good…the silver jedi told Morten that his mother must die for the future of the jedi order. That was a mistake….Morten would not allow this…and removes the armless jedi head in one slice of his saber and full of hate…he reaches out a hand to force choke the other…watching the life drain out of his face and his body go limp. Mortens journey to the dark side was complete…he decided to go to Ziost… a Sith order has returned to the ancient Sith homeworld…. Fallen Jedi Morten Hassanov joined the Sith on Ziost and began his rise….on becoming Sith Acolyte under his master Lord Vitae…he became Magnus. Acolyte Magnus now saw the wisdom of the dark side, yearning for more power and determined that death would befall any that stood in his way. 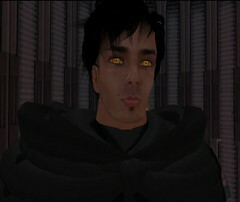 An active member of the empire, Acolyte Magnus was made a Sith Lord by Dark Lord Summanus. Lord Magnus vowed to ensure his rise to power within the order, the death of their enemies and expansion of the sith empire. Lord Magnus was made part of the Sith Legends Royal Guard, protecting Dark Lord Summanus and Dark Lady Melanchol on a mission to Coruscant. Despite his complete loyalty to his superiors , Magnus began to become suspicious of the sith empire he has fought for and curious of the motives of some of its key members. He could not foresee what would happen to his order but every fibre of his being told him a change was coming. Sith are not allowed to be exiled…they are killed…however Lord Magnus, betrayed by his order and cast out has been allowed to survive. He has not known a sith order be this reckless before and will observe his former masters from the shadows to see what their plans may be. Former Dark Lady of the Sith Legends Darth Ptas reached out to Lord Magnus with the offer to join her in the legendary sith order - The Dark Lords of the Sith on Dromund Kaas. Seeing a new path to glory away from the traitors that turned their backs on the Sith Legends, Magnus accepted. The order is now becoming strong again and Magnus now seeks to gain a position of influence in this order…an ambition that escaped him when Sith Legends disintegrated. Lord Magnus has now taken an Apprentice, Adept Enigma.